Through the Gem City College clock repair school, students gain practical, real-world experience to prepare them for the clock and watch repair industry. Classes help those who desire to learn a new skill or trade and those interested in starting their own business in the repair and restoration of clocks and watches. Students learn to disassemble, clean, lubricate, and assemble several different clocks as part of our clock repair school. 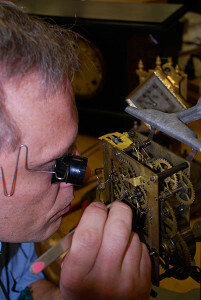 Repairs are taught on several different types of clocks including chime, cuckoo, striking, alarm, and electric. Students are taught how to repair mainsprings, missing or broken teeth in gears, lathe work, re-pivoting wheels, and bushing work. Adjustments and repairs are also taught on the clocks previously mentioned as well as grandfather clocks. Evaluate your skill set by exploring the fundamentals of modern mechanical watch repair including cleanliness, lubrication, endshake adjustment, and the verification and analysis of the escapement function. Today’s luxury watch consumers demand perfection. Our course is perfect for the watchmaker or dedicated finisher. We’ll cover disassembly and assembly of common watch cases and more. When finished, graduates will rejoice in making many clock owners happy through the repair and maintenance of heirloom clocks. Several of our clock repair school graduates have successfully opened their own specialized clock repair shops. For additional information regarding the Clock Repair Program, please see pages 17 and 22 of the course catalog located here. Our classes are developed to meet the specific needs of modern horologists. Sign up today. Repair, clean, and adjust mechanisms of timing instruments, such as watches and clocks. Includes watchmakers, watch technicians, and mechanical timepiece repairers.